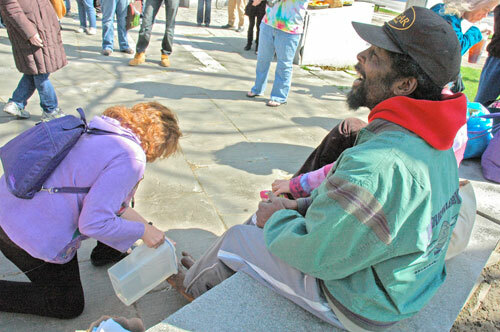 Remembering “the God who gets personal” and touches us in our most hidden places, The Welcome Church celebrated Maundy Thursday washing the feet of people living on the streets of Center City. The ancient ritual might have seemed out of place on a corner of Logan Square, in the shadow of corporate towers and the massive Cathedral of Saints Peter and Paul. But re-enacting the way Christ knelt and served his disciples reminds us that this is how all ministry begins — we get on our knees in prayer and reach our hands out to serve, Welcome Church Pastor Violet Little said in her homily. “God always comes to us where we are, and is willing to touch us in those places we want to hide or are ashamed of,” Little said. The Rev. Violet Little washes the feet of Darren, a Welcome Church member. About 75 worshippers — homeless persons, high school students, visitors who brought plates of oranges and cheese for refreshment, doctors, members of The Welcome Church pastoral team and a bishop — surrounded a card-table altar laden with chalices and pitchers of water. As they prayed and sang buses and cars raced by, while some homeless persons watched from the fringe or slept in the park, oblivious to the service. Across 18th Street, priests vested in cassock and surplice greeted a steady stream of worshippers for Holy Thursday services at the basilica. Occasionally, a jogger or passerby would wander up to the circle to see what was happening. Bishop Burkat annoints the hands of Dr. John Scanlon (center) and representatives of Temple’s School of Podiatric Medicine and Arch Street Methodist Church, who are partnering in a new outreach to provide foot care for persons living on the streets. After Communion, Bishop Claire S. Burkat anointed the hands of participants in The Welcome Church’s latest partnership, a venture with a local physician and Temple University’s School of Podiatric Medicine to offer free foot care to the homeless community. In the group were Dr. John Scanlon, a local podiatrist and chief medical officer at Chestnut Hill Hospital, who helped put the partnership together; representives of Temple, whose students will be part of street outreach teams, and the pastor of Arch Street Methodist Church which plans to house a drop-in podiatric clinic. “We truly are all connected as God’s hands and feet,” Bishop Burkat said. 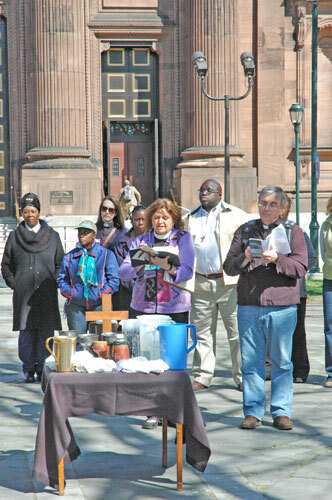 The Welcome Church is a church without walls that serves persons living on the streets of Center City. Rev. Little, an ELCA pastor and therapist, serves part-time as pastor with a clergy team of volunteers that includes Episcopalians, Presbyterians and Methodists. The Church formed after Pastor Little opened a respite center at the nearby Lutheran Church of the Holy Communion where the homeless could come in out of the cold for tea and conversation without fear of being hassled or forced to move on. As visitors to this Welcome Center asked for Bible study, communion and hospital visits, a congregation emerged. The church meets outdoors because that is where its congregants live. Many people think of the church as a building, says Darren, a Welcome Church member who lives beneath the Market Street bridge. “But it’s in here,” he says, drawing his hands toward his heart. Worship services are in the late afternoon, because many of the homeless sleep in the mornings because it is too dangerous for them to sleep overnight. “The community lets me know what it needs, and I try to help make that happen,” Pastor Little says. This is truly “emergent” ministry, where programs and services arise from the needs of the community. Being church without a building also makes The Welcome Church’s witness of faith open for all to see — joggers, tourists, commuters and the church at large. 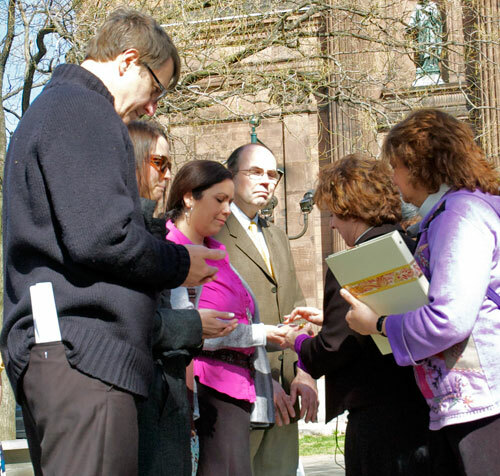 It is a living example of the ELCA’s desire to be a public church.